Huckleberry season came early this year in Eastern Washington, taking us a little bit by surprise. We missed the best picking but still came away with a couple of gallons of these precious gems. If you’ve ever gone huckleberry picking, you’ll understand why I’m a sort of stingy with them. The three “B”s (bending, bees, and bears) make huckleberry picking a real labor of love. I make a small batch of jam each year, then usually just throw a handful into pancakes, muffins, cakes and breads. As much as I love huckleberry pie, it’s hard for me to part with that many berries in one fell swoop. I like pie, but seriously? I’d rather turn those berries into margaritas! Mmmm….margaritas. Ahem. ‘Scuse me…I’ll be right back. 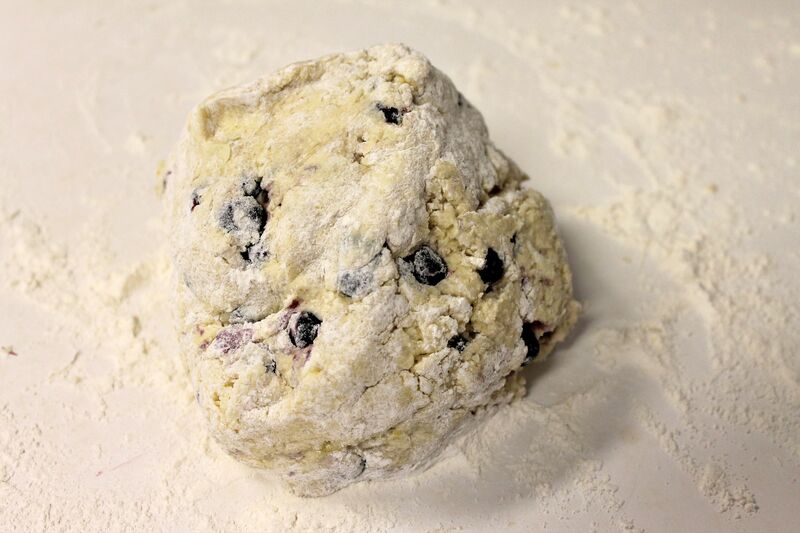 With just one cup of frozen huckleberries, you can make eight large (or twelve small) light, fluffy, buttermilk scones. Add a little huckleberry icing to drizzle over the top, and you’ll have all the wonderful huckleberry flavor you could want. Makes 8 large or 12 regular scones. Blueberries may be substituted for huckleberries if you wish. Make sure to use frozen berries! In a large bowl, sift the flour, sugar, baking soda, baking powder, and salt. 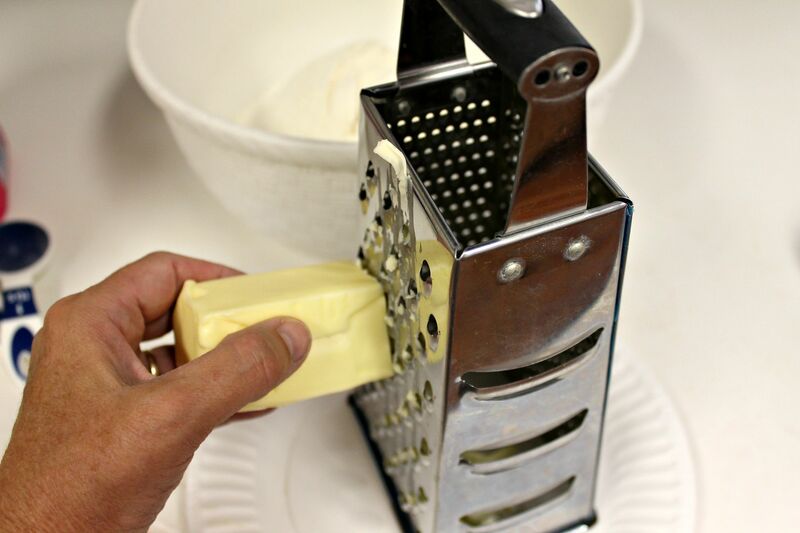 Grate the cold butter using a large-holed grater, and work the butter into the dry ingredients, using a pastry blender or your fingers. Make sure there are no large lumps of butter. 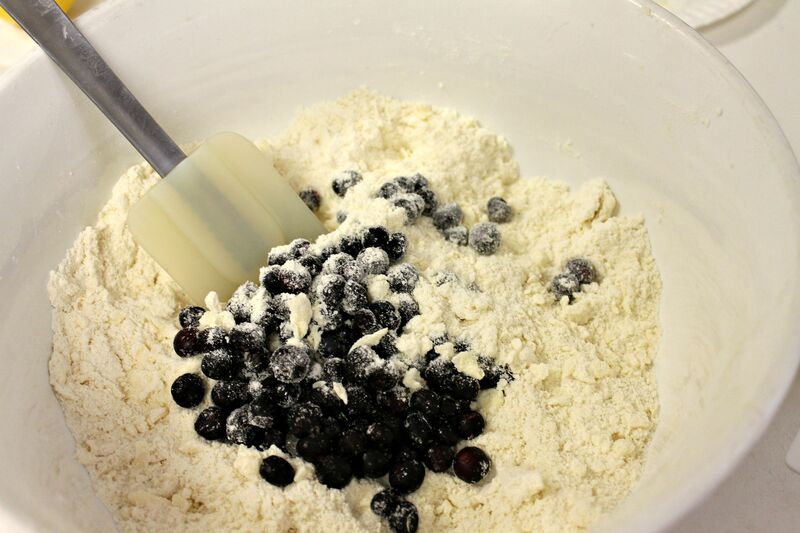 Toss the frozen huckleberries in the flour mixture and set aside. In a glass measuring cup or small bowl, beat the buttermilk, egg, vanilla, lemon juice, and zest until well combined and frothy. Make a well in the dry ingredients and add the liquid ingredients. Stir just until combined. Don't over stir. Spoon dough onto a floured surface and turn to coat. Don't knead the dough - just gather it into a ball and make sure the outside is covered with flour. *For 8 large scones: Pat into a flat circle about the size of your hand. Move to the parchment covered baking sheet. Gently flatten into a circle approximately 1-inch thick. Brush lightly with buttermilk and sprinkle with sugar, if desired.With a sharp, floured knife, cut into 8 wedges, lifting the knife straight up with each cut. 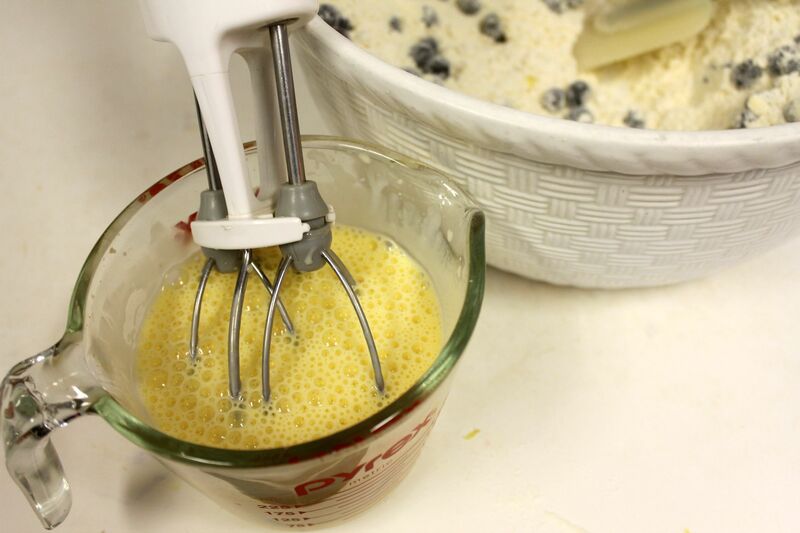 Using a metal spatula, pull each wedge out slightly to leave a little space between each one. Bake for approximately 18-20 minutes, or until golden brown. *For 12 regular scones: Divide the dough into two pieces. Gently form each half into a ball and pat into 4-inch circles. Place on parchment covered baking sheet and gently flatten into circles about ¾-inch thick. Brush lightly with buttermilk and sprinkle with sugar, if desired. With a sharp, floured knife, cut each circle into 6 wedges, lifting the knife straight up with each cut. Using a metal spatula, pull each wedge out slightly to leave a little space between each one. Bake for approximately 16-18 minutes, or until golden brown. 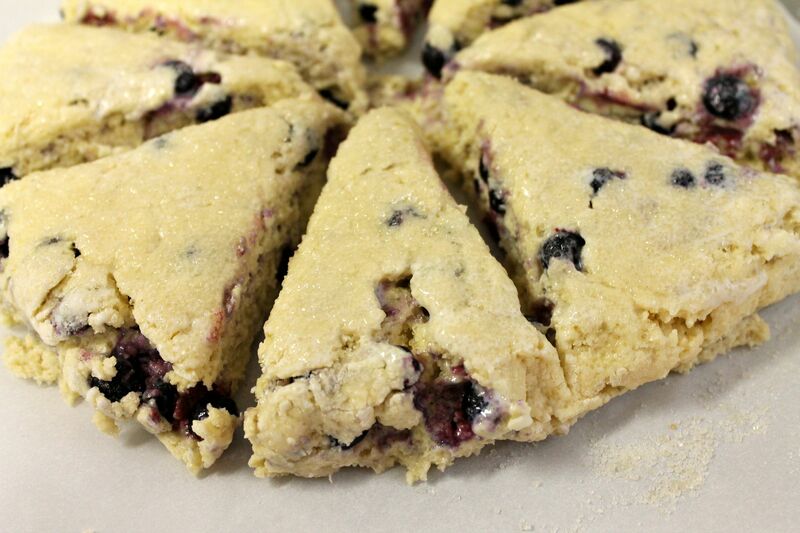 Move pan to a cooling rack and allow the scones to cool on the pan. 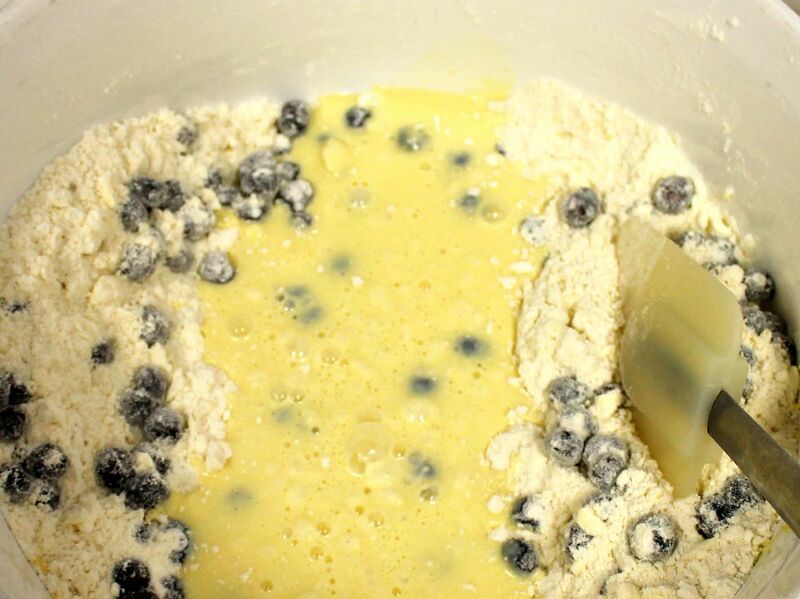 Toss the berries in the flour mixture. Mix liquids and dry ingredients. Easy, Tiger. Just barely combine them. Flatten on baking sheet. Brush with buttermilk and sprinkle with sugar. Cut into wedges. Separate slightly. Bake! 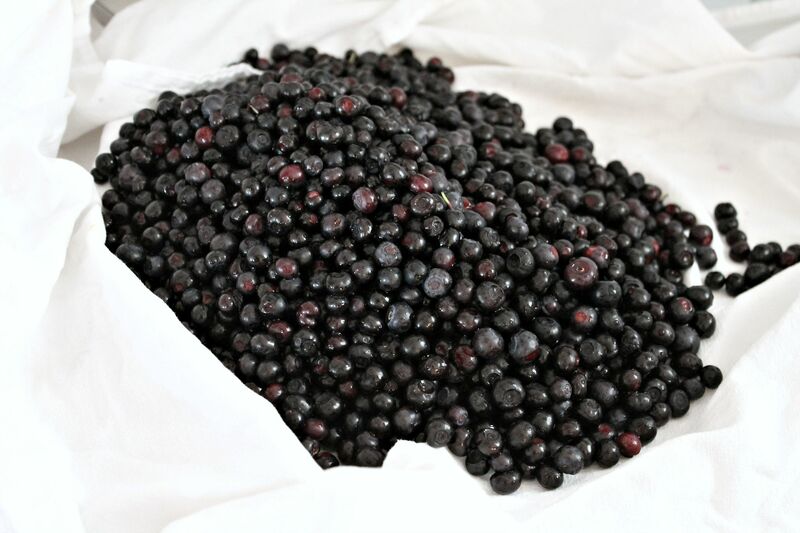 Slowly bring 1/2 cup huckleberries and 2 tablespoons sugar to a boil in a small pan. 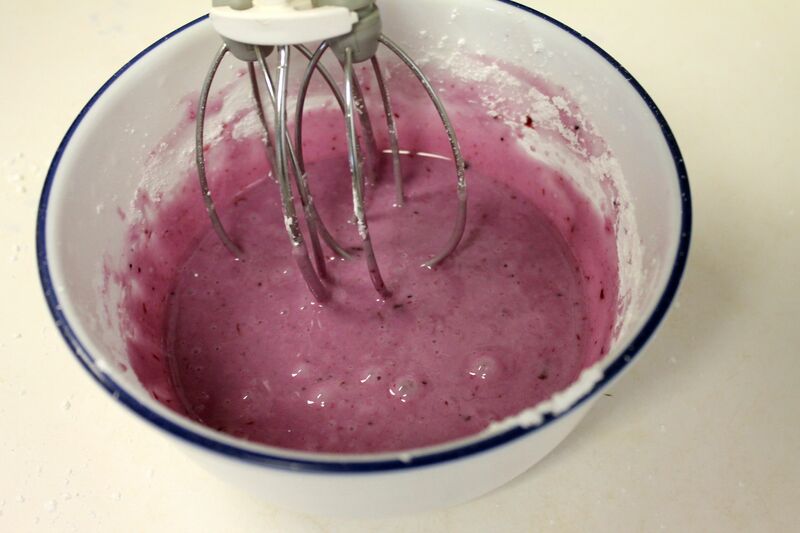 Whisk in 1 teaspoon cornstarch and let the mixture simmer on low for 2 minutes, stirring constantly. Allow mixture to cool. Combine 1 tablespoon of this sauce with 2 tablespoons milk then whisk in enough powdered sugar to make a thick glaze. 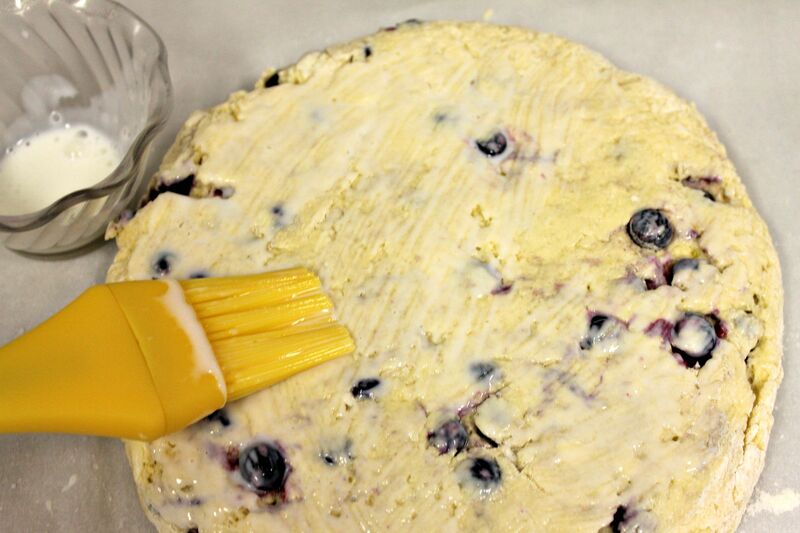 Use a ziploc bag with the tip snipped off to decorate the scones. I know what you’re going to ask. I do! Yes, you can substitute blueberries for huckleberries. I’d recommend the frozen wild blueberries though, because they are so flavorful. If I didn’t love huckleberries so much, I’d cave in and use blueberries – but I am willing to ignore my fear of bears (I carry bear spray), my problematic ankle (I destroyed it huckleberry picking two years ago and have to wear a brace and be very, very careful) my hatred of yellow jackets (I wear unscented everything and dress in neutral colors) and the back breaking bending and squatting that goes with the experience, because there is just nothing like a wild huckleberry! Sounds like fun, huh? But OH so worth it. Have a margarita scone and see for yourself! 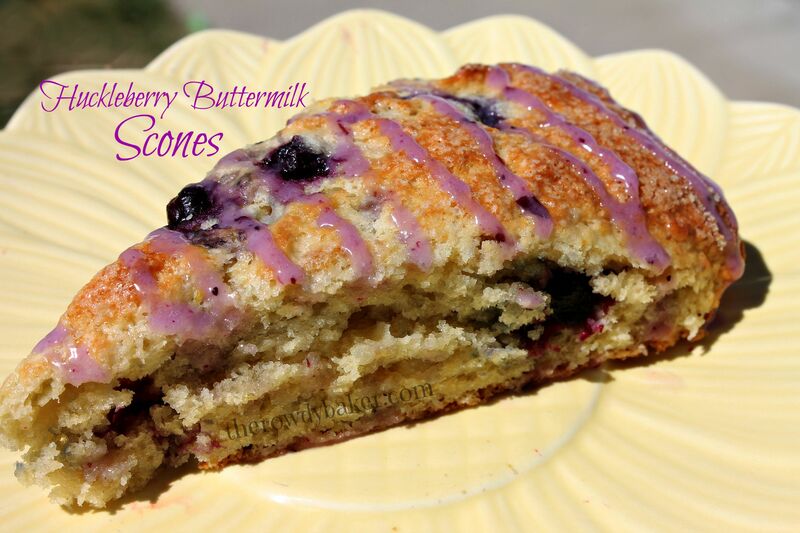 This entry was posted in Breads, Breakfast, Scones, Sweet pastries and tagged huckleberry buttermilk scones, huckleberry lemon scones, Huckleberry scones, wild huckleberry scones by Lorinda. Bookmark the permalink. As always, lovely photos and entertaining prose. 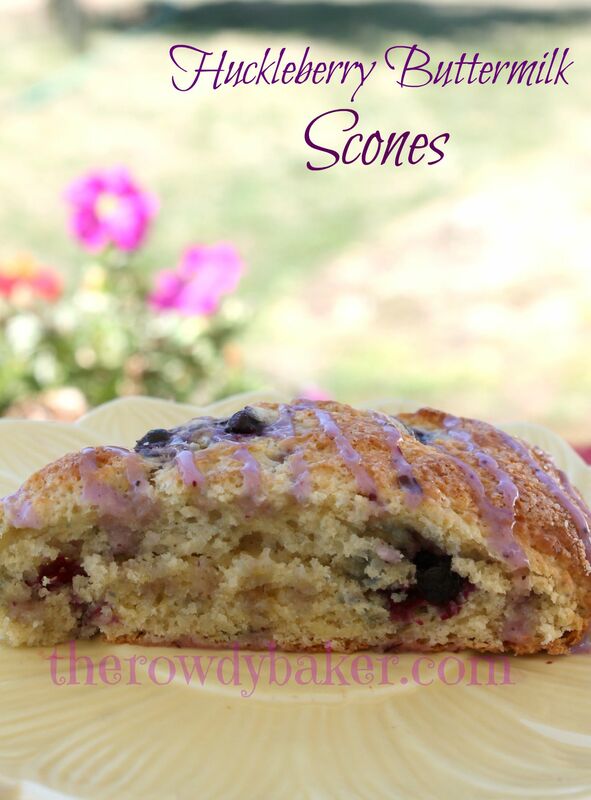 And some darn good scone-making tips! Thanks again, Lori! Thanks, Dawn! 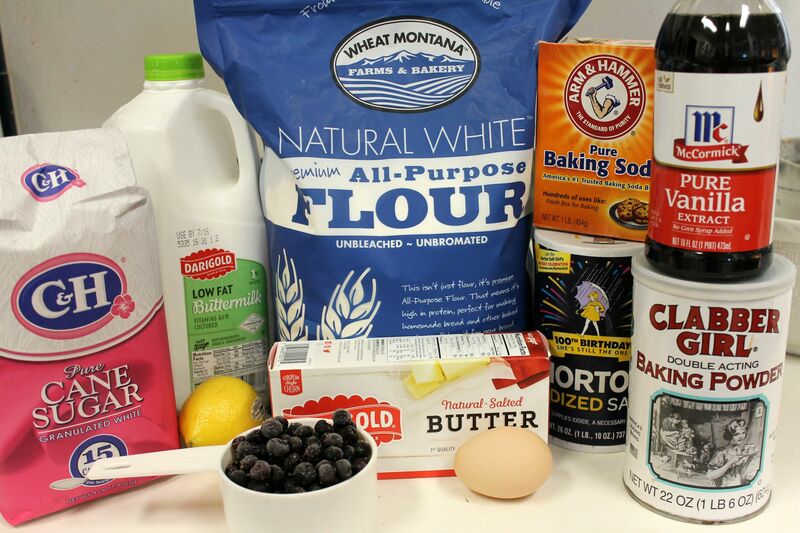 You’ve got to try my huckleberry muffins, too…my favorite. Huckleberries are a precious commodity, aren’t they?